The GlobCover Portal provides access to the results of the GlobCover project. GlobCover is an ESA initiative which began in 2005 in partnership with JRC, EEA, FAO, UNEP, GOFC-GOLD and IGBP. 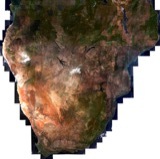 The aim of the project was to develop a service capable of delivering global composites and land cover maps using as input observations from the 300m MERIS sensor on board the ENVISAT satellite mission. 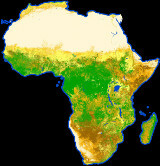 ESA makes available the land cover maps, which cover 2 periods: December 2004 - June 2006 and January - December 2009. Please see below the links to download the products. Use the links below to download the map. Should you write any scientific publication on the results of research activities that use GlobCover products as input, you shall acknowledge the ESA GlobCover 2009 Project in the text of the publication and provide ESA with an electronic copy of the publication (due@esa.int). If you wish to use the GlobCover 2009 products in advertising or in any commercial promotion, you shall acknowledge the ESA GlobCover 2009 Project and you must submit the layout to ESA for approval beforehand (due@esa.int). The Globcover 2005 products are made available to the public by the POSTEL Service Centre with the agreement of ESA. - ESA DUE web site (http://due.esrin.esa.int/page_globcover.php). Should you write any scientific publication on the results of research activities that use Globcover 2005 products as input, you shall acknowledge ESA and the ESA Globcover Project led by MEDIAS France/POSTEL in the text of the publication and provides ESA with an electronic copy of the publication (due@esa.int). If you wish to use the Globcover 2005 products in advertising or in any commercial promotion, you shall acknowledge ESA and the ESA Globcover 2005 Project, led by MEDIAS France and you must submit the layout to ESA for approval beforehand (due@esa.int).